C.J. Sansom’s Winter in Madrid is a wonderful departure from his excellent Shardlake Series. Dissolution, Dark Fire, Sovereign, Revelation,and Heart-stone are all Sansom novels set in sixteenth century England. ( See my overviews of the aforementioned here at gordonsgoodreads.com). 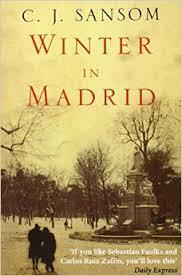 Winter in Madrid is a novel set in 1940, just after the Spanish Civil War. It is a story of love, friendship and high adventure surrounding the rescue of a young veteran who left England after the evacuation of Dunkirk to join in the fight against the Fascists in Spain. English prep school friends find themselves together on Spanish soil some seeking their fortune, others justice and lost love. Sansom delivers a bonus history of post Civil War Spain enveloped in an intriguing story that moves with a fine pace and bountiful energy. His writing is never flowery but captures the moment perfectly with a judicious vocabulary. One exception is ” coffee.” You will see what I mean as you devour this good read. Samson’s latest in the Shardlake Series is Lamentation, which is next on my Sansom list. I will post upon completion. This entry was posted in Fiction, Novels, Uncategorized and tagged C.J. Sansom, Franco, Shardlake Series, Spanish Civil War, Winter in Madrid. Bookmark the permalink.